But you can't get the full effect without sound. I've learned to recognize this rustling from wherever I am in the house. I have collected a large basket full of ornaments from the floor and various other resting places, and will do one last total tree-redecoration tonight. geez you ought to leave a tree up all year round. it's looks and sounds like the perfect thing to keep all your kitties occupied. merry xmas from the boyz and me. Your kitties make wonderful holiday greeting cards. Your cats rock... how many of them do you have? 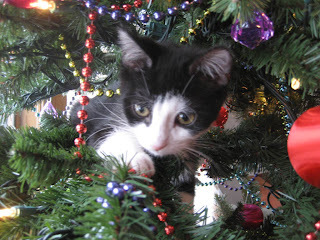 I've just loved this Christmas kitten countdown! You can't possibly get mad at the little darlins. Cute! Cute! Cute! That's so funny, -d ma. I thought exactly the same thing -- the kitties will be VERY sad to see the tree get packed away.